Hope you had a wonderful Christmas! I have a card to share today that’ll be great for all winter long. And the die is a fun and easy interactive one you can use all year long. Check out the interactive blog gallery for more ideas. Lawn Fawn got me excited when they came out earlier in the year with the Stitched Hillside Popup Die – so so so so many possibilities! 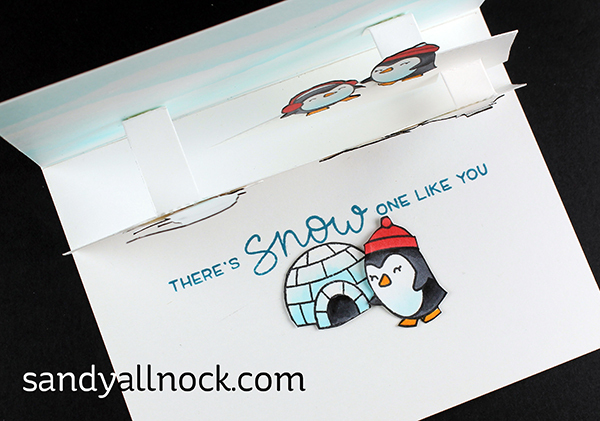 Today’s card is wintry with all the clean white cardstock, but just think how this would work with green cardstock, or a patterned paper with tiny flowers or little grass pattern. All kinds of fun hillside scenes, adding different stamps to it – lots of fun! Watch the video below or click HERE to see it in HD on YouTube. 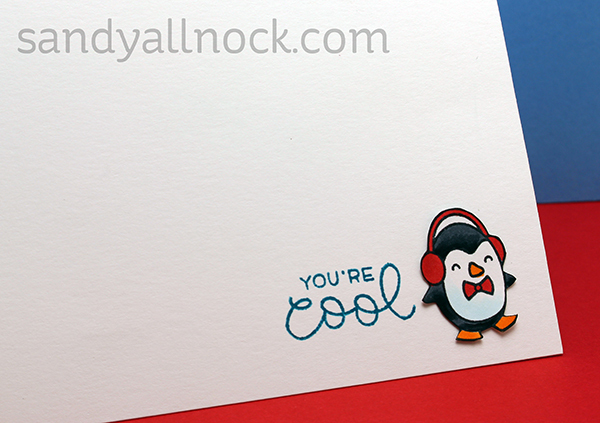 I kept the outside simple; and in order to keep color from seeping through from the outside to the inside by stamping the penguin directly on the card, I used one of the cut-out penguins along with a simple stamped sentiment. 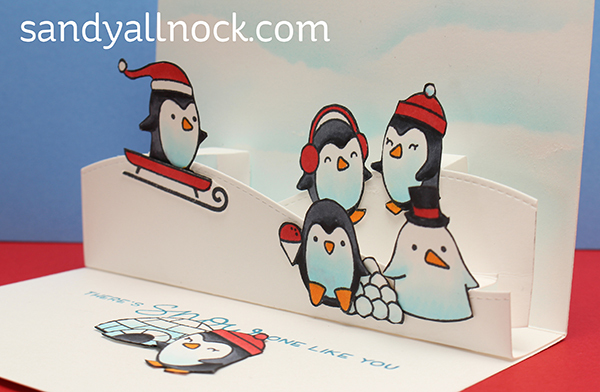 Here’s the overhead view of the card – the two pieces in the back attach to the card base so it all pops up perfectly. Lots of stamps will work with a pop-up die; I’ve got two sets with penguins (I listed them all for you in the supply list below) , but think of all the possibilities! I’m imagining grassy hillsides and so much more for other seasons! 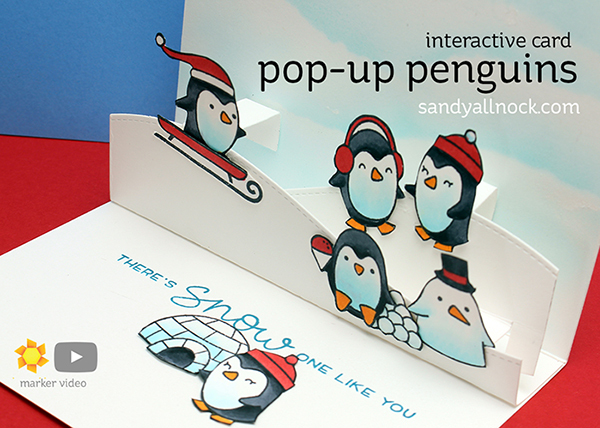 Sandy – loved the card and am going to give it a try. Your pups are absolutely adorable and enjoyed the video so much. Sending lots of good energy in hopes that you are feeling better soon. Thanks for sharing so many things today. Awesome die and beautiful card! Adorable card! Love this! Thank you for sharing, Sandy! So cute. This is one of my favorite sets. Super cute! You make it seem so easy to do. Your card is just so darned cute. I love an interactive card. Sweet! Snow cute! and you’re snow sweet to make the video, also. I’m snow happy I follow you! I love this type of card that can be used all winter long. So cute! This pop up die looks like a “must have” for me – thanks for demonstrating it. And your penguins are having a lot of fun, I can see – love that snow cone! A very sweet card!